Happy New Year, Ducks fans! We at “Quack of the Bat” hope that everyone had a wonderful holiday season and was able to enjoy this festive period as 2017 officially came to a close. With that, the 2018 calendar year has now begun, and with it, the drive towards Opening Day of Long Island’s All-Star Summer. Surely, teams will begin to build their rosters over the coming weeks and news about games, promotions and other events will be announced. However, there is already plenty of news surrounding the team as the 19th season of Ducks baseball gets underway. It appears as though 2017 Ducks starting pitcher Tim Melville will be adding another Major League organization to his resume. The right-hander signed a minor league contract with the Baltimore Orioles on December 22, making them the sixth MLB club that he has been a part of (Royals, Tigers, Reds, Twins and Padres). Melville was one of the biggest success stories among the Ducks roster last year. He joined the team after having pitched in the Majors with the Reds in 2016. The 28-year-old started nine games over the first seven weeks of the season, compiling a 3.45 ERA and 48 strikeouts. 14 of those punch outs came in a win at New Britain on June 7, which tied a single-game franchise record. It was no surprise that Melville’s contract was purchased by the Twins three days later. He would excel with Triple-A Rochester, posting a 4-3 record, a 2.70 ERA and 64 strikeouts over 11 games (10 starts). That performance was worthy enough of a promotion to the big leagues on August 21, just over two months after his contract was purchased from the Ducks. Although he would struggle in three combined appearances (one start) between the Twins and Padres in the big leagues, he proved his value to MLB organizations during the 2017 campaign. Melville is certainly hoping to break spring training with the big club in Baltimore, but for now, the team has assigned him to Triple-A Norfolk of the International League. Down in the Caribbean Winter Leagues, the playoffs have begun for a number of teams. One of those, Aguilas de Mexicali of the Mexican Pacific League, has earned a pair of walk-off victories to begin its postseason. In Game One of their series against Venados de Mazatlan, 2015 Duck Ryan Kussmaul pitched a scoreless eighth inning before 2014 Duck C.J. Retherford won the game in the bottom of the ninth. 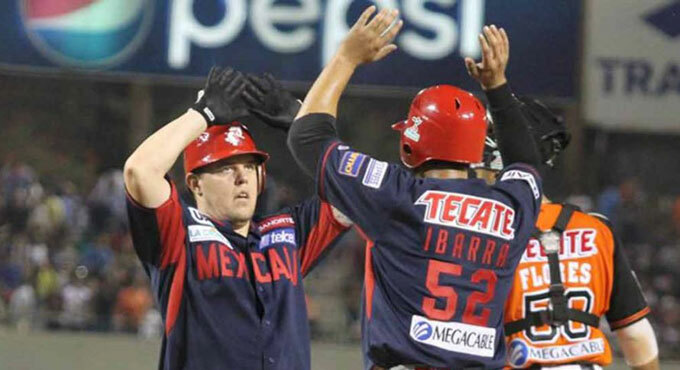 Retherford’s two-out RBI double put Aguilas ahead in the series. Former Patriot and Skeeter Roy Merritt started on the mound for Venados and was lifted from the game following eight innings of one-run ball. The pair of former Ducks teamed up again in a 3-2 walk-off win the following day. Kussmaul tossed a scoreless eighth inning once again to keep the score tied at two, and Retherford stepped up to the plate to begin the bottom of the 11th. 2015 and 2016 Duck Nick Struck had tossed three scoreless innings of relief for Venados but gave way to Marcos Rivas to begin the inning. Retherford launched a walk-off homer to send the crowd of over 16,000 at Estadio B-Air into a frenzy. Aguilas finished the regular season in first place with a 26-7 record, a full six games clear of Mayos de Navojoa, who finished second. The two pitchers were teammates for three seasons together on Long Island, and they have now been joined together once again down in the Caribbean. John Brownell and Jared Lansford are both playing postseason baseball with Caribes de Anzoategui in the Venezuelan Professional Baseball League. Brownell has typically been spending his winters in Puerto Rico with Criollos de Caguas, but with some uncertainty surrounding their season following Hurricanes Irma and Maria, the righty took advantage of an opportunity to pitch in Venezuela. Lansford has recently been spending the year overseas in the Chinese Professional Baseball League. Caribes finished fourth in the league with a 32-31 record. Brownell threw four innings of two-run ball in his lone start on December 21, while Lansford struggled, yielding 13 runs in 12 innings of work over five games (four starts). Caribes has jumped out to a 1-0 lead in the playoff series with Navegantes del Magallanes. Blue Crabs veteran pitcher Daryl Thompson, who ranked fourth in the Venezuelan League with a 2.79 ERA and second in strikeouts with 50, started Game One and earned the win with six scoreless innings. Brownell is slated to start Game Four on Saturday. Two more Ducks alumni are also part of a postseason bound team in the Dominican Republic this winter. 2017 starting pitchers Rafael Perez and Alfredo Simon have been teammates with Gigantes del Cibao in the Dominican Professional Baseball League. The club finished the regular season with a 29-21 record, good for first place by two games over a pair of other teams. Perez pitched out of the bullpen and did quite well, allowing just two runs over 17 and two-thirds innings across 22 appearances, good for a 1.02 ERA. Simon totaled eight games, starting seven of them, and was 2-0 with a 4.03 ERA and 17 strikeouts in 29 innings. Thus far, Gigantes is out to a 1-3 start to the four-team round robin playoffs that are going on now through January 18. Neither Perez nor Simon has yet to appear in the playoffs. Tigres del Licey leads the league at 4-0 to this point and features several recent Atlantic League alumni (Alexis Candelario, Somerset; Bryan Evans, Lancaster; Patrick McCoy, Southern Maryland; Kevin Munson, Lancaster; Kyler Newby, Somerset; Angelys Nina, Bridgeport). Be sure to keep an eye on the blog over the next few months for a variety of content. As the roster takes shape, we will have features on the players that will make up this year’s team. In addition, we will have further updates on winter league action and much more regarding the All-Star Summer festivities. It’s been a little over a month since the end of the 2016 Atlantic League season, but there is still plenty of baseball being played. Down south, several members of the Liberty Division champion Ducks are playing on rosters in the Caribbean Winter Leagues. Teams in Mexico, Puerto Rico, Venezuela and the Dominican Republic are home to several Atlantic Leaguers from this past season and recent years, as guys play in hopes of catching a scout’s eye and earning an invite to spring training by one of Major League Baseball’s 30 organizations. It has been quite the exciting start to the Mexican Winter League season! Through about 30 games entering Wednesday, three teams are all within one game of each other for first place and seven of the eight teams are all within four games of each other. Tomateros de Culiacan are currently in first place at 18-12, but Mayos de Navojoa and Naranjeros de Hermosillo are right behind them at 17-13. The only former Duck on either of the them is Quincy Latimore, who plays with Navojoa. The outfielder was part of the Ducks during spring training in 2014 before having his contract purchased by the Nationals. Thus far, he is batting .241 with five homers, 13 RBI and 13 runs in 15 games. Other 2016 Atlantic Leaguers on the roster are outfielder Cole Garner (New Britain) and pitcher Connor Little (Somerset). Culiacan features a trio of Skeeters pitchers from 2016 in Sean Gallagher, Derrick Loop and Aaron Thompson, along with Patriots first baseman Bryan LaHair. Finally, we turn to Venados de Mazatlan, who brings up the rear in the league at 8-22. One of the struggling squad’s bright spots has been Nick Struck. The right-handed pitcher struggled out of the gate for Long Island this year but turned things around and posted an impressive 3.35 ERA in 39 games (nine starts) for the Ducks in 2016. Thus far, he has allowed just five runs (four earned) in 16 and one-third innings over three starts for Mazatlan. He’s currently teammates with Mickey Storey (Somerset) and former Southern Maryland slugger Cyle Hankerd. Although Puerto Rico has the fewest teams of any Caribbean Winter League (five), they have easily the most Ducks alumni. A total of five 2016 Ducks as well as five others who have previously played for Long Island are currently on rosters in the league. Things are still in the early stages, but Cangrejeros de Santurce currently holds first place at 9-3. Their roster features pitcher J.C. Romero, a member of the 2015 Ducks who is continuing to play the game he loves. The southpaw has been brilliant in eight games thus far, throwing six and two-thirds scoreless innings while striking out six batters. He is joined by pitcher Jon Velasquez (Sugar Land), catcher Wilfredo Rodriguez (Sugar Land) and infielder Robert Andino, who played for Somerset on their 2015 championship team before returning to the Major Leagues with the Marlins this past season. Right behind Santurce at 7-4 is Criollos de Caguas. Returning to the team is familiar face John Brownell, who has pitched for Caguas in 2015 and 2013. He made his debut with the team this past Saturday and fired five scoreless innings, allowing just three hits. Long Island resident Anthony Vega, who showcased a strong combination of speed, power and defense with the Ducks in 2016, also calls Caguas home this winter. The outfielder has played in seven games thus far, compiling three RBI and six runs scored. Also on the club is pitcher Ricardo Gomez, who has previously pitched with the Ducks in 2010 and 2015 but called York home in 2016. He has thrown seven and two-thirds scoreless innings thus far, striking out 12 in seven games and recording five saves. Other former Atlantic Leaguers include pitchers Jose De La Torre (Somerset) and Brian Moran (Bridgeport) along with infielders Luis Mateo (Somerset), Angel Sanchez (Southern Maryland) and David Vidal (Somerset). Indios de Mayaguez is currently third in the league at 7-5 and features plenty of Atlantic League talent. Their roster currently includes Andrew Barbosa, who has impressed with the Mets organization after having his contract purchased by the Braves from the Ducks in 2015. The tall left-hander, who battled injuries this year but still went 3-0 with a 1.51 ERA in 16 games (15 starts) in the Mets system, has yet to pitch in a game. He’s joined on the roster though by 2016 ALPB Pitcher of the Year Jonathan Albaladejo (Bridgeport), pitcher Ross Seaton (Bridgeport) along with catchers Raffy Lopez (Bridgeport) and Alex Marquez (York/Bridgeport). In addition, Yankees outfielder Aaron Judge is with the club. 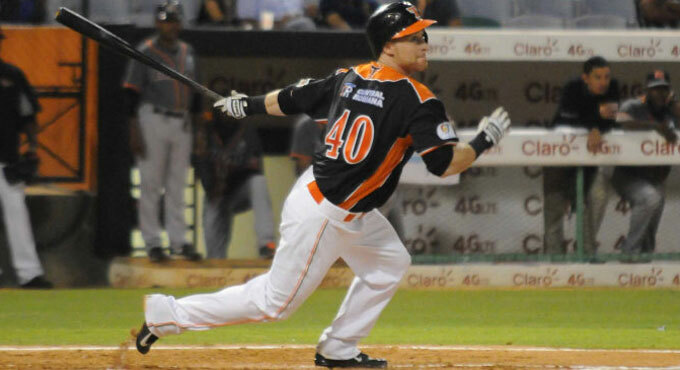 Gigantes de Carolina sits fourth in the Puerto Rican Winter League. Right-handed pitcher Freddie Cabrera, a second half signing for the Ducks in 2016, is now pitching for them. In five games, he has compiled a 2.70 ERA. Former Ducks catcher Jan Vazquez (2014) is also on the roster but is just 1-for-19 with two runs scored at the plate in nine games. Pitcher Andrew Johnston (Sugar Land) and infielder Jeff Dominguez (Sugar Land) are also with the team, as well as Major League veteran catcher Yadier Molina. Finally, Tiburones de Aguadilla may have a 1-12 record to begin the season, but they boast a lot of talented players on the roster. Pitcher Jarret Leverett started the year strong for New Britain before coming to Long Island and going 2-2 with a 4.50 ERA in four regular season starts and tossing seven shutout innings to win his lone postseason outing. The lefty has struggled though for Aguadilla, going 0-3 with a 5.02 ERA in three starts. Infielder Ruben Gotay was a key signing for the Ducks at second base, as he batted .275 with seven homers and 63 RBI for the Flock. The former Met has also impressed this winter, batting .300 with three homers and 10 RBI through 13 games. The home runs and runs batted in are both currently league-best totals. 2013 Duck Ian Snell is continuing to play baseball and also is part of the club. The righty has allowed just one run in six games out of the bullpen thus far. Other 2016 ALPB alumni on the team include pitchers Efrain Nieves (Somerset) and Chris Rearick (Bridgeport/Sugar Land), catcher Yovan Gonzalez (Somerset) and infielder Jovan Rosa (New Britain). We also can’t forget that the manager is former Duck and Met Carlos Baerga. The Dominican Republic is home to six different teams and also features some tight standings in early going. The top three teams in the league are separated by just three and a half games. One of those is Leones del Escogido, who is 10-10 thus far and features the only Duck currently playing in the league. That man is outfielder and bench coach Lew Ford, who is trying to repeat his success from a year ago when he won the Dominican Winter League championship and was named Championship Series MVP with Escogido. Thus far, the Ducks’ all-time batting leader is off to a slow start at 8-for-41 with five RBI and six runs in 14 games. Other 2016 Atlantic Leaguers on the roster include pitcher Jose Veras (Bridgeport) and outfielder Ruben Sosa (Bridgeport). Finally, we head to Venezuela and check in on their eight-team league. There are currently five Ducks alumni playing in the league, two of which were part of the 2016 roster, two that were on Long Island in 2015 and one that played for the Ducks several years ago. Navegantes del Magallanes has seen several Ducks players don the uniform, and this winter, pitcher Amalio Diaz is part of the roster. The right-hander, who went 5-2 with a 2.09 ERA and five saves in 52 games this past season, has pitched in 13 games thus far. Unfortunately, he has gone 0-1 with a 4.66 ERA, but he does have eight strikeouts in nine and two-thirds innings of work. The Venezuela native has also pitched seven scoreless outings in the month of November. Pitcher Jack Snodgrass has also just joined the team. He was terrific for the Ducks in the first half of 2016, going 6-6 with a 3.79 ERA in 14 starts before his contract was purchased by the Texas Rangers organization. On the roster with them both is former Met and member of the 2016 Bridgeport Bluefish, Endy Chavez. Reegie Corona quickly became Long Island’s second baseman during the 2015 season and posted an impressive first half, batting .331 before having his contract purchased by the Washington Nationals organization. He is now with Tiburones de La Guaira but is off to a slow start with five hits in 26 at-bats, one homer and three RBI in 17 games. Ryan Kussmaul served primarily as the Ducks’ closer in 2015 and then had his contract purchased by the Arizona Diamondbacks organization in 2016. He was recently added to the roster of La Guaira but has yet to pitch in a game. He is joined on the roster though by several 2016 Atlantic League players. They include pitchers Mike Antonini (Bridgeport), Kelvin De La Cruz (Lancaster/York), Sam Gervacio (Bridgeport) and Jake Hale (Sugar Land) along with catcher Jose Gil (Bridgeport). The other team with a Ducks alumnus is Caribes de Anzoategui. Another squad that has also previously featured former Atlantic Leaguers is now home to former Ducks pitcher Shane Youman. The left-hander, who dazzled in 2011 before his contract was purchased by the Lamigo Monkeys of the Chinese Professional Baseball League, has made seven starts thus far and is 2-1 with a 3.21 ERA and 21 strikeouts. He has allowed just one earned run in each of his past four starts. Fun fact about Youman: he holds the Ducks franchise record for single season ERA at 0.66 (minimum 50 innings pitched). Also on the roster with him are pitchers Donovan Hand (Somerset), David Kubiak (Bridgeport), Kyler Newby (Somerset) and Daryl Thompson (Southern Maryland), catcher Rossmel Perez (Bridgeport) and infielders Luis Domoromo (Bridgeport) and Luis Hernandez (Bridgeport). The Puerto Rican Winter League, officially known as the Liga de Beisbol Profesional Roberto Clemente, employs a round robin format. Three of the league’s four teams qualified for the postseason: Indios de Mayaguez, Criollos de Caguas and Cangrejeros de Santurce. Currently, Mayaguez has the best record of all three in the playoffs at 6-2 and is coming off of an incredible 7-5 win over Caguas in 16 innings on Wednesday. This wild contest saw Caguas score single runs in the eighth and ninth to force extra innings and saw Mayaguez score three runs in the 13th, only for Caguas to match them in the bottom half of the frame. After six hours and 14 minutes, Mayaguez finally reigned supreme. This contest also featured a plethora of former Ducks and Atlantic Leaguers on both sides. John Brownell started the game for Caguas and turned in a magnificent performance. Like the big-game pitcher Ducks fans have frequently seen, the righty tossed six innings of shutout baseball, allowing just four hits and no walks while striking out six. He left with the game scoreless, but one of his former Ducks teammates helped put Mayaguez on top. Following a sacrifice fly, Elmer Reyes delivered a two-out RBI single to increase the lead to 2-0. Caguas began their comeback in the eighth on a solo homer by Jeff Dominguez, who spent time with the Somerset Patriots and Sugar Land Skeeters last season. In the 13th inning, Ducks infielder Randy Ruiz had one of the most controversial at-bats of the game. As a pinch-hitter with runners at second and third and one out, he grounded a ball towards short. Interference ended up being called on Kennys Vargas, who was running at second. No run ended up being scored, Ruiz reached at first, and according to the box score, Mayaguez manager Pat Kelly and Caguas second baseman David Vidal (of the Somerset Patriots) were ejected. Three runs eventually scored later that inning for Mayaguez. Then in the 16th, Reyes came up big again. He singled for his third hit of the game and later scored the game’s final run on a double by Vargas, which was allowed by former Duck and Skeeter Derek Blacksher. In the end, former Bluefish pitcher Kanekoa Texeira closed out the game to earn the save. Looking at the postseason as a whole, Mayaguez has also been led by former Duck Andrew Barbosa, who recently signed with the New York Mets. He’s won both of his playoff starts, allowing no runs in 11 innings. The southpaw has yielded just three hits and three walks while striking out eight. 2010 Duck Ivan Maldonado has given up just two runs in 10 and two-thirds innings over two playoff starts. Reyes is batting .265 over eight games with one RBI and three runs, while Ruiz has struggled, collecting one hit in 15 at-bats with one RBI and one run. However, he did lead the league with 24 RBI during the regular season. For Caguas, who is 3-4 in the postseason, Brownell has made three starts and pitched well. Despite an 0-1 record, he has a 2.25 ERA, surrendering four runs on 15 hits and two walks in 16 innings with 11 strikeouts. Santurce is just 2-5 to this point but has a pair of Ducks relievers from this past season. Ricardo Gomez has collected two playoff saves, but he has also allowed two runs and three hits in two and two-thirds innings. J.C. Romero has pitched twice, taking one loss and giving up a run on two walks and a hit batter in one inning of work. They are also joined by former Patriot Robert Andino. The other series pits Navegantes del Magallanes against Caribes de Anzoategui. Magallanes won Game One 8-4, and Caribes responded with a 10-3 win in Game Two. Unfortunately, the series and postseason has not featured any former Ducks on either side. However, there have been a few former Atlantic Leaguers. They include Juan Apodaca (Lancaster; Magallanes), Mike DeMark (York; Magallanes), Daryl Thompson (Southern Maryland; Caribes), Joe Testa (Somerset; Caribes), Sam Gervacio (Bridgeport; Caribes) and Jose Gil (Camden; Caribes). South of the border in Mexico, there are a pair of semifinal series that feature a team leading two games to one. The first has Aguilas de Mexicali up on Mayos de Navojoa after they took the first two games before seeing Navojoa earn a win. Former Duck and Bluefish C.J. Retherford is with Aguilas and is 5-for-11 with a double, a homer four RBI, and two runs scored in the series. In fact, the infielder is batting .370 with three doubles, two homers, six RBI and five runs in seven playoff games. 2015 Atlantic League Player of the Year Welington Dotel is also with Aguilas but is just 1-for-10 with two RBI, two runs and three walks. Dotel is batting .273 in seven playoff games with two doubles, four RBI, six runs and five walks. Former Ducks Spring Training signee Quincy Latimore is playing for Navojoa but is just 1-for-11 with a run scored and a walk in the series. He has played nine games thus far in the postseason and is hitting .250 with two doubles, three RBI and three runs. Daniel Moskos, a reliever for Lancaster in 2015, earned the save for Navojoa in Game Three with a scoreless ninth inning. The other series currently has Yaquis de Obregon up 2-1 on Venados de Mazatlan. Obregon currently has former Skeeter Dustin Martin on the roster. He is 2-for-10 thus far in the series with one RBI, one run and two walks. In addition, former Revolution pitcher Josh Judy is their closer and has two saves in the series, allowing just two hits in two scoreless innings. Martin has been fantastic this postseason, batting .343 in nine games with three doubles, three homers, eight RBI and eight runs. Southern Maryland slugger Cyle Hankerd is playing for Mazatlan and was 0-for-3 in both Games One and Three of the series. However, he had a big game in between, going 2-for-5 with a homer, three RBI and two runs. He’s been a .324 hitter this postseason with a homer, nine RBI and three runs over nine games. Joining him on the squad are former Barnstormer Olmo Rosario (1-11, RBI, BB in the series) and former Patriot Yunesky Sanchez (4-11, 2 2B, 2 R, BB in the series). Our final stop is in the Dominican Republic where, like Puerto Rico, it’s a round robin style. Four of the six teams in the league made the playoffs: Tigres del Licey, Leones del Escogido, Toros del Este and Estrellas de Oriente. Licey has dominated the postseason with a 12-2 mark thus far. However, their roster only features one Atlantic Leaguer currently. That would be former Revolution and Blue Crabs relief pitcher Leyson Septimo. The southpaw has made three appearances and has thrown one scoreless inning, allowing just a walk. Leones del Escogido and Toros del Este are both tied for second with 6-8 records in the playoffs. Lew Ford has played in nine playoff games for Escogido and is batting .250 with two doubles, one homer, eight RBI and two runs scored. On the mound, former Skeeter Kelvin Villa is 1-1 with a 4.22 ERA in three games (two starts). Former Revolution starter Shawn Hill is 1-0 in four games but has a 5.63 ERA, surrendering five runs on nine hits in eight innings while striking out seven. Another former Revs pitcher, Edward Paredes, has appeared in five games out of the bullpen. During that span, he has allowed a run on three hits and four walks while striking out two in two innings. As for Toros, they currently have former Ducks reliever Donnie Veal, who signed with the Texas Rangers earlier this offseason. However, the lefty has struggled in the playoffs, giving up four runs on five hits and six walks in four games of action. Former Barnstormer Bryan Evans is 2-0 with a 2.37 ERA in four starts, striking out 13 batters in 19 innings. Bringing up the rear right now is Estrellas de Oriente at 4-10, which is a bit surprising since they were tied with Licey for the best regular season record at 29-21. Former Duck and Bluefish infielder Sean Burroughs is currently with Estrellas but is hitting just .154 with a pair of walks in five games. Earlier this winter, he hit .297 in 10 games with La Guaira in Venezuela and .343 in nine games with Obregon in Mexico. On the mound, a pair of former Patriots are struggling with Estrellas. Randy Boone is 0-1 with a 5.40 ERA in two games (one start), while Kramer Sneed, who joined Somerset late in the season and for the playoffs, is 0-0 with a 5.40 ERA in three starts. Former Bluefish and New York Met Robert Carson has pitched in eight games of relief, yielding just two runs (one earned) while striking out five in four and two-thirds innings. That will wrap things up for the latest edition of the winter hot stove report. We’ll be checking back in with each of the leagues as they get into the championships, and eventually, the Caribbean Series. If we are missing any players that you’ve seen playing for these teams in the Caribbean or playing in other leagues this winter, please send us a note and tell us about them! As the Atlantic League season approaches, we’ll continue to have exclusive interviews with players signing with the Ducks and additional feature articles. As we have done many times in the past here on the blog, we like to provide an update to what some of the most recent Ducks (and Atlantic Leaguers) are doing during the offseason. For many, the term ‘offseason’ does not include just sitting at home and preparing for next year. Rather, they use this time to continue playing in hopes of improving aspects of their game or being seen by the many Major League scouts that watch winter league games. The biggest hotbed of winter baseball is in the Caribbean, where Atlantic League players can be found across the rosters of teams in four different countries. We’ll start our roundup by taking a look first at Puerto Rico, where a total of six players who spent time with the Ducks in 2015 are currently playing. Two teams are currently tied for first place in the four-team league with a record of 14-10: Criollos de Caguas and Indios de Mayaguez. On Caguas is Ducks pitcher John Brownell, the 2015 Atlantic League Pitcher of the Year. He has continued his success this winter, posting a 2-1 record with a 2.33 ERA and 16 strikeouts in five starts. Most recently, he threw five scoreless innings on Tuesday night in a 3-1 win at Mayaguez. Teammates of Brownell include pitcher Derek Blacksher, who had a strong season with Sugar Land in 2015 just two years after joining the Ducks for their 2013 championship run, and infielder Sergio Miranda, who spent the 2014 season with Long Island. Blacksher has also been pitching well with a 1-0 record and a 0.73 ERA in five games (four starts). Somerset Patriots infielder David Vidal is also with Caguas. As for Mayaguez, their roster features Ducks designated hitter Randy Ruiz and infielder Elmer Reyes. Both players are off to slow starts, with Ruiz batting .185 and Reyes batting .193. However, they have combined for three homers, 18 RBI and 11 runs in 18 games. 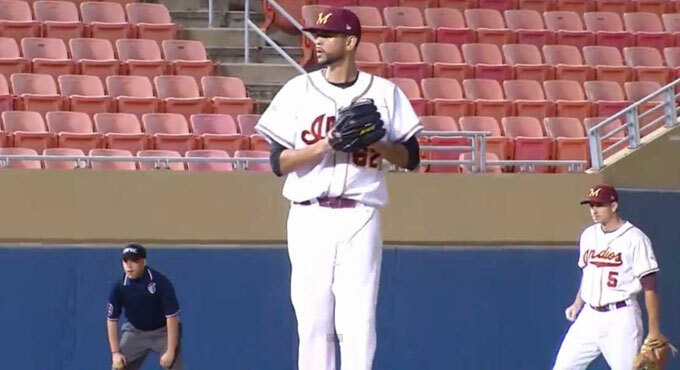 They are joined on the Mayaguez roster former Patriots pitcher Tyler Herron and former Ducks pitcher Ivan Maldonado, who was with the Flock in 2010. Former Bluefish pitcher Kanekoa Texeira is also with the team. Gigantes de Carolina features a plethora of Atlantic League talent, including four players with ties to the Ducks. Two member of the 2015 squad, relief pitchers J.C. Romero and Frank DeJiulio, Jr., are among the four. Both pitchers are in the bullpen for Carolina but have not been as strong as they were for Long Island. DeJiulio, Jr. is 0-1 with a 5.40 ERA in eight games, but he does have eight strikeouts in six and two-thirds innings. Romero has a 6.35 ERA in seven appearances but did collect a save in his second outing with the club. Joining them are two former Ducks in catcher Jan Vazquez and pitcher Ian Snell. Vazquez, who spent all of 2015 with the Double-A New Britain Rock Cats in the Colorado Rockies organization, has five hits in 21 at-bats with a homer and three RBI over seven games for Carolina. Snell has been strong out of the bullpen, compiling a 2.08 ERA and seven strikeouts in eight and two-thirds innings. Also on the roster are Jobduan Morales, who was a catcher with the Bluefish in 2015, and Jeff Dominguez, who spent this past season with the Skeeters and has also spent time with the Patriots. The fourth and final team in Puerto Rico is Cangrejeros de Santurce, and the club feature three 2015 Atlantic Leaguers. Relief pitcher Ricardo Gomez, who joined the Ducks late this past year, has earned two saves in 12 appearances while going 1-1 with a 1.13 ERA and 13 strikeouts. Joining Gomez with Santurce are Somerset Patriots pitcher Matt Zielinski and Patriots shortstop Robert Andino. Former Atlantic Leaguers Benny Cepeda (Long Island, ‘10; Road Warriors, ‘11), Jon Velasquez (Camden, ‘12-13) and Pete Parise (Lancaster and Southern Maryland, ‘14) also play with the team. Head south from Puerto Rico, and you will eventually hit Venezuela. The South American country features an eight-team winter baseball league that is filled with Ducks and Atlantic Leaguers from the 2015 season. One of the best teams in the season’s first half was Tiburones de La Guaira, as they went 19-13 to finish in first place. The team features three recent members of the Ducks, including infielders Sean Burroughs and Reegie Corona as well as relief pitcher Ryan Kussmaul. Corona has played the most of the three, a total of 23 games, and is batting .215 with three RBI, 10 runs and three doubles. Burroughs has appeared in just five games thus far and has five hits in 19 at-bats with three RBI. Finally, Kussmaul has pitched in six games, allowing just one run on five hits and two walks in six and two-thirds innings while striking out six. The three are also teammates with Somerset pitcher Kyler Newby and former Riversharks/Skeeters outfielder Brian Burgamy. Another Venezuelan team featuring some former Ducks is Navegantes del Magallanes, who we talked about recently when they played in the Serie de las Americas in Miami. Starting pitcher Bobby Blevins and outfielder/bench coach Lew Ford both call Magallanes home currently and both played there last year as well. Blevins has made four starts thus far and is 1-2 with a 7.47 ERA, pitching pretty well in his first two starts before suffering a pair of setbacks. Ford has yet to appear in a game this winter, but should be getting some playing time soon. They are joined in Magallanes by catcher Juan Apodaca, who spent 2015 with Lancaster, and infielder Renny Osuna, who played this past season with Southern Maryland and Sugar Land. Two other players with Ducks ties are also playing winter ball in Venezuela. Starting pitcher Sergio Perez is a member of Bravos de Margarita, and although he currently sports a 1-3 record, he has pitched to a 2.60 ERA in 10 starts. The righty, who ended the 2015 season with Southern Maryland, has struck out 32 batters in 52 innings of work. Perez is teammates with former Patriots outfielder Chris Marrero. Outfielder Trayvon Robinson, who was signed by the Ducks and reported to Spring Training last year before receiving a contract with the Arizona Diamondbacks, is playing with Leones del Caracas. In four games, he has four hits in 15 at-bats with two doubles, one RBI and two runs scored. He is joined on the club by four members of last year’s Patriots team (pitchers Mickey Storey, Buddy Boshers and Andrew Carignan along with outfielder Aharon Eggleston) as well as Bluefish pitcher Cory Riordan and Barnstormers pitcher Joe Gardner. The next stop on our Caribbean journey will be to Mexico, where we find another eight-team league. There are less Ducks connections currently playing in the country but still plenty of Atlantic Leaguers to talk about. The only member of the 2015 Ducks continuing their season south of the border is outfielder Delta Cleary, Jr. He is now playing with Yaquis de Obregon and has four hits and one RBI in 23 at-bats over seven games. Three other 2015 Atlantic Leaguers are teammates with him there, including Daryle Ward (Southern Maryland/Sugar Land), Dustin Martin (Sugar Land) and Ramon Delgado (Sugar Land). Three other teams in Mexico have a player with a Ducks connection. The first team is Aguilas de Mexicali, who won the first half this year at 22-13. Infielder C.J. Retherford, who joined the Ducks late in 2014 and did the same with Bridgeport in 2015, is off to a hot start. He is batting .325 over 43 games with five homers, 25 RBI, 28 runs and nine doubles. Joining him on the squad are 2015 Atlantic League Player of the Year Welington Dotel, who is now leading the Mexican Pacific League with a .376 batting average, and Patriots pitcher Daniel Sattler. Mayos de Navojoa is tied for first place in the second half and is currently has outfielder Quincy Latimore on the roster. Latimore signed with the Ducks in 2014 but was offered a contract with the Washington Nationals just prior to Spring Training. He has played in 45 games thus far and is batting .277 with seven home runs, 33 RBI, 20 runs and 12 doubles. Latimore is teammates currently with former Barnstormers Blake Gailen and Daniel Moskos. Finally, relief pitcher David Kopp is currently with Caneros de los Mochis, who finished a game out of first place in the first half of the season and sits tied for first in the second half. However, the 2014 Duck has yet to appear in a game. Joining him on the squad are three guys who played with the Patriots last year: starting pitcher Lucas Irvine, starting pitcher Roy Merritt (who also pitched with Sugar Land), and infielder Matt Fields. Our final stop on this tour will be in the Dominican Winter League, which features six teams. Five of the six have an Atlantic League veteran on the roster. Like Navegantes de Magallanes, we talked about one previously on the blog. That was Aguilas Cibaenas, who ended up winning the inaugural Serie de las Americas. The roster features the only former Duck playing in the Dominican, and that is relief pitcher Donnie Veal. The southpaw and former big leaguer is currently being used as a situational reliever and is 1-0 with a 1.93 ERA in four and two-thirds innings over 15 games. He is teammates there with four members of the Atlantic League from 2015: Sean Bierman (Patriots), Kameron Loe (Bridgeport), Kelvin Villa (Sugar Land) and Luis De La Cruz (York). Tigres del Licey is in first place right now at 21-14. The team features two members of the York Revolution in shortstop Wilson Valdez and relief pitcher Leyson Septimo, the latter of which has a 1.69 ERA in 12 games. Estrellas de Oriente is in second place and has two Patriots pitchers on the roster in Randy Boone and Kramer Sneed. Sneed has thrown seven scoreless innings over two starts thus far. The only other team with multiple Atlantic Leaguers on the roster is Leones del Escogido. The roster there includes a pair of York Revolution pitchers in Edward Paredes and Julio DePaula. Paredes is pitching to a 0.96 ERA in 14 games. A couple of other former Atlantic Leaguers are also on the roster in Yunior Novoa (Lancaster, ‘11; York, ‘12-13) and Jarrett Grube (Southern Maryland, ‘09-10). The final two teams with 2015 Atlantic League players on the roster are Gigantes del Cibao, who have former Bluefish pitcher Robert Carson, and Toros del Este, who have former Patriots pitcher Kelvin De La Cruz. That will do it for this week’s edition of the Wednesday Winter League Roundup. If there is anyone that you know of who is playing for a winter league team, please feel free to let us know. You can either note it in the comments section of this post or fill out a contact form on the blog. We hope to have some comments from some of the Ducks who are playing in the Caribbean in our winter roundup post.